Kitchen and Bath Remodeling Blog from Berkut - Everything You Need to Know — Berkut Inc. In this blog we’re finally going to answer the question everyone’s been asking. Since Fabuwood launched at the KBIS show in Orlando, we’ve been talking a lot about the Q12 standard. So, what exactly is Q12? Simply put, Q12 stands for quality 12. To break this concept down further, Q12 is a combination of 12 significant standards of quality. But how is this relevant? With all the choices available today, it’s important to understand the components that make up high quality cabinetry. As a savvy buyer, you need to be aware of what makes a quality cabinet, and what you may be sacrificing if you do not choose a cabinet with the 12 standards that define Q12. Understanding good kitchen cabinet quality, doesn’t have to be a mystery. Once you know what to look for, you’ll be able to tell the quality cabinets from those that appear pleasing on the surface. 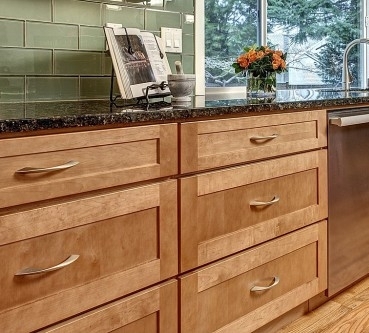 Learn what it takes to get the quality cabinets you want. A Q12 cabinet encompasses 12 facets that together create a superior product. Therefore, you should trust your taste, but also make sure all 12 standards are applied throughout production, to guarantee a kitchen that will maintain its beauty and efficiency for years. Carefully selected top-grade lumber, guaranteeing the finest and most dependable kitchen cabinets. Rigorous inspection process assures that only first-class products, free of irregularities leave the plant. To fully permeate a Q12 assessment, expert finishing methods are required to heavily influence first impressions and assure a lasting finish that is easy to maintain. Fabuwood’s own pro touch technique uses renowned brands to create a durable simple to clean cabinet that will hold its beauty for years. Another important facet of Q12 is the required use of dovetail construction. A process that involves plywood side panels to perfectly interlock with a solid wood face frame through corresponding dovetail grooves. This highly resilient technique that Fabuwood introduced to the market guarantees that Q12 cabinet lines are secure, strong, and long-lasting. The anti-warp component involves the use of plywood panels comprised of rigid reinforcement beams. By applying the beams with a dovetail construction technique to secure all components, Fabuwood meets this standard ensuring a strong, reliable build that is resistant to distortion. For a cabinet to receive complete Q12 entitlement, wood must be used to help maintain structural integrity. To ensure a unified and organic design build, Fabuwood manufactures robust cabinet lines with wooden corner blocks, which keep the purity of an all-wood cohesive construction. For superior structural longevity, this Q12 feature requires that the back of a cabinet is constructed from one piece of solid half-inch plywood. Fabuwood fulfills this standard by manufacturing cabinet backs with a strong and single piece of plywood to ensure durable strength and dimensional stability. In order to be considered Q12 compliant, a cabinet must have flush inner framers that provide an attractive appearance while giving added dimension to the internal area. Fabuwood’s Q12 lines display prime craftsmanship with their flat surface top and bottom interior planes that result in convenient and practical usage. Treated and finished cabinet interiors are another significant feature of Q12 as they produce a clear statement of quality and attention to detail. As opposed to manufacturing with an applied lining, Fabuwood’s vigorous top treatment techniques create a refined and durable design that is free of bubbling, peeling and chipping. Another great characteristic of the Q12 Qualification is the use of compact hinges with built-in, soft-close mechanism. Fabuwood uses the smooth-running capability and soft closing action of Blum’s tandem plus blumotion hinges, providing an impeccably gentle and fluid cabinet function. Cabinets built with smooth full-extension glides guarantee an enhanced running action that maximizes storage to its full capacity and ensures Q12 eligibility. Fabuwood manufactures Q12 cabinets with Blum’s tandem plus runners and soft-closing technology, precisely utilizing space while also preventing damage and depreciation. To ensure proper door alignment and function, a Q12 cabinet requires an effortless system utilizing a degree of mechanical precision for installing a perfectly positioned drawer faces. Fabuwood innovates with a unique technique using circular discs that allow for easy 3/8” adjustments in any direction, resulting in a Q12 cabinet that achieves an aesthetically graceful balance. The final Q12 metric requires a thorough review at each manufacturing stage to ensure the completed product meets the provisions specified in the quality assurance system. Upon factory exit, a stamp of approval is given to show Fabuwood’s commitment to quality control from the very first level of Q1 to the final Q12 stage, thus guaranteeing a superior and immaculate end product. when you want a new look. Options range from round wooden knobs to broad, sleek chrome bars, glass handles, bronze pulls, as well as a host of other styles and finishes. Just be sure that all your choices are equated to the task. match their contents heights (best in pantry cabinets). They are great for pots and pans and lids. Pullouts also come in all shapes and sizes. It can be used as a spice rack, a tray divider, and many other options. This can greatly enhance a standard base cabinet’s fixed shelves. Nowadays, many kitchens are designed with standard Lazy Susan’s for its corners. While it’s timeless storage piece for most L-shaped kitchens, many people are bored with the idea of it, enter the Blind Corner organizer. A three-tier blind corner optimizer. Designed for 15” to 18” door openings, the Blind Corner organizer is perfect for storing pantry items, specialty cookware, and small appliances. By using a blind cabinet to store the item, you get to maximize your kitchen space. Organization is very important to kitchen functionality and there is nothing worse than a drawer full of utensils and cutlery scattering about. There are many options to help sort this problem out. 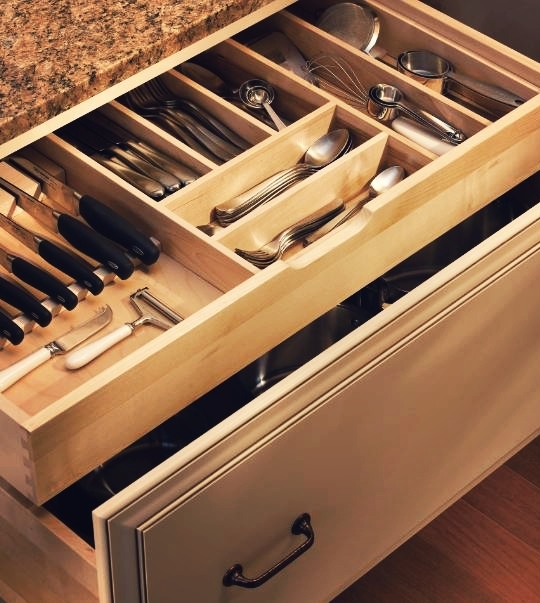 To start, cutlery dividers has been the must have option for new kitchen remodels for a long time. These days it’s improved quite a bit, I recommend the double tiered cutlery divider because one drawer is never enough for spoons and fork. Now, from dinner plates to plastic containers, your kitchen items are easily accessible and always organized with a pegboard system. This is just a taste of the many storage and hardware options to enhance your kitchen. Schedule an appointment to come into our showroom and I will show you how to truly enhance your new kitchen remodel. What granite color goes with my cabinets? How do I choose the right colors for my countertops and cabinets? This is a critical decision that is made when designing your kitchen or bath, and this article by one of our lead designers will walk you through the process.